Throughout the rise of humankind we have always faced new horizons. The humanoids in the next forest were the first. The land of others like us, the next. But what if some of us have arrived at a point in human exploration and advancement where there is no more, no farther land to discover, no other planets to inhabit and no more great scientific and industrial discoveries to be made. While scientists, researchers, and their like, have worked wonders, many of those wonders have become burdens. Is this our direction now? Only a gifted few are aware of the direction, and even if more become aware, there will never be enough of the enlightened. Far too many are not intelligent enough to help better the world in any significant way, or to govern themselves through any knowledgeable and rational system. A not-to-be-missed book exploring the consequences of our constant search for new horizons and where it is leading us. 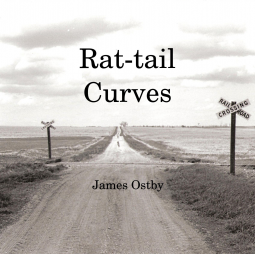 "Rat-Tail Curves is philosophic and historical without forgetting its first intention to be a readable and enjoyable book. It is really quite unlike most of what I have read. Author James Ostby shows his talent for writing clearly throughout the work, and there is an interesting literary voice at the core of this book." "I found this book to be very thought-provoking and a true literary work." Rat-Tail Curves is philosophic and historical without forgetting its first intention to be a readable and enjoyable book. Author James Ostby shows his talent for writing clearly throughout the work.